I love the colors of this dress… navy blue, dark green, winter white, and a little pop of mustard yellow. If you’re wanting to experiment with color more, you could pop a cozy yellow sweater *over* the dress for a different look. For a lunch meeting at Beatrix last week (or maybe two weeks ago), I paired it with a cream turtleneck underneath and an olive green moto jacket on the top. The dress has a slit on one side so suede over the knee boots too the place of tights! I’m so not ready for tights season yet, you guys. For sizing notes, I’m wearing a medium in the dress, but could have probably gotten away with a small! Runs true to size. For the turtleneck, definitely size up! I’m wearing a medium and it’s still very fitted. But I got it to wear under dresses this season (it’s cropped), so I don’t mind it being tight! 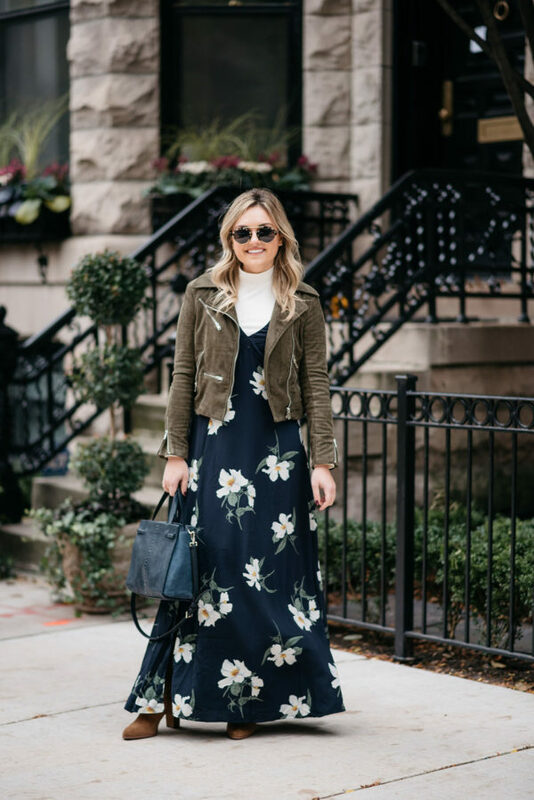 Have you tried wearing any of your maxi dresses in the fall? Would love to hear your styling tips, too! I love how you dressed up this dress! 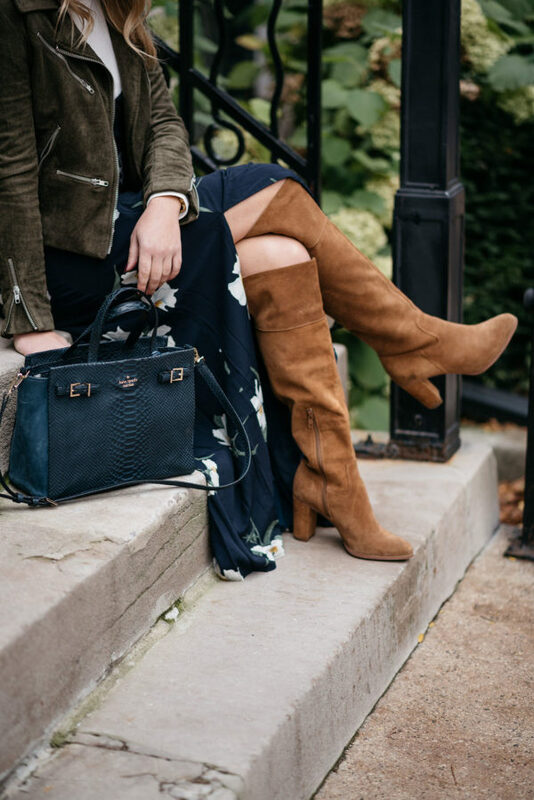 The slit is perfect with the boots! Thanks girl! Boots double as pants sometimes this time of year, haha! 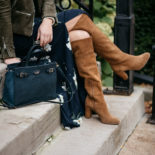 Love this combination – you look fantastic! Totally going to break out my maxi dresses for the colder season. Great look! 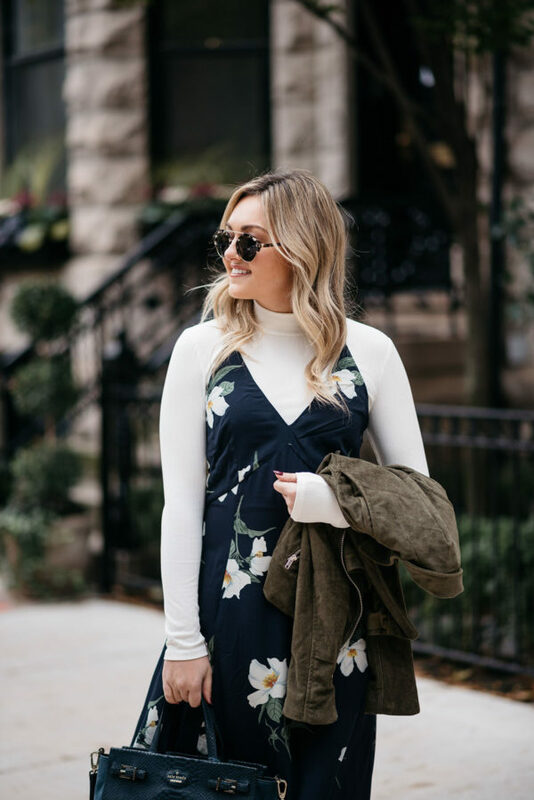 I love wearing floral dresses in Fall and you are looking so cute in this boho like outfit! This maxi dress is so pretty, love these layers.